Please join us for an Ash Wednesday service on February 14th at 7:00pm. Ash Wednesday marks the start of the holy season of Lent, a time for reflection and repentance in preparation for the celebration of Easter. For centuries, Christians have received a cross of ashes on the face at the beginning of that season as a reminder of mortal failings and an invitation to receive God’s forgiveness. As in previous years, Holy Trinity clergy will be taking part in Ashes to Go, along with clergy from other congregations. 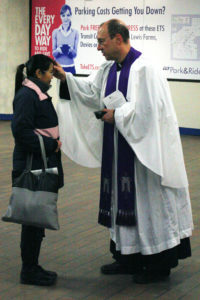 Ashes will be offered to people at LRT stations, in addition to the 7:00pm service at Holy Trinity.